If created and managed properly, an Amazon Pay-Per-Click (PPC) campaign on Amazon can help you sell more inventory faster, while increasing your organic rankings as well. However, the simplicity of Amazon’s advertising platform is a double-edged sword. But let’s try to make it something that works for us. In this guide, I will outline all the PPC optimizations that I use to juice my profits as much as possible for my private label products on FBA. Starting from the beginning, let’s break down exactly what Amazon’s paid search is and what it looks like. People don’t go to Amazon to window shop. First, Amazon receives millions of searches every month. Second, a majority of those searches are long tail, meaning that consumers use three or more keywords to perform their search. They know what they want. Users go to Amazon http://amazon.com and type in their desired product. From there, Amazon’s search engine returns the products that it deems most likely to satisfy the user’s desire. These are the “organic” results. What we’re interested in, however, are the “paid” search results. These are the listings you see mixed in with the organic results. In addition, these ads sometimes appear in the right column or below the organic results. Creating Amazon PPC ad campaigns is a very straightforward process. However, it’s important to understand the strategy and milestones before starting to advertise. The last thing we want to do is make quick decisions that could undermine our campaigns! Run campaigns to find profitable keywords that convert to sales. Increase bids for high-performing keywords. Advertising Cost of Sales (ACoS) – The percent of attributed sales spent on advertising. This is calculated by dividing total ad spend by attributed sales. For example, if you spent $4 on advertising resulting in attributed sales of $20, your ACoS would be 20% (ie. $4/$20 = 0.20). Impressions – The number of times your ads were displayed. Once identified, it may take up to 3 days to remove invalid clicks from your reports. Clicks from the last three days may be adjusted due to click invalidation. Clicks – The number of times your ads were clicked. Once identified, it may take up to 3 days to remove invalid clicks from your reports. Clicks from the last three days may be adjusted due to click invalidation. You already have an optimized Amazon product listing. Ensure you’re doing everything possible to convert a visitor into a sale, by having the following. This is how the listing for Jungle Stix came together. You are focusing only on your actual Amazon listings. We are only going to focus on sending traffic to your product page on Amazon (ie. Amazon Sponsored Products). We will not focus on Amazon Product Ads, which drives traffic to your own website, away from Amazon. And you really don’t need a unique website outside of Amazon to start selling FBA successfully. Fortunately, Amazon PPC is relatively simple compared to other ad platforms, like Google AdWords or Facebook Ads. Generating a list of keywords. Setting your budgets and bids. Creating logical campaigns and ad groups. What sort of ad budget should I start with on Amazon FBA? For the budget, I recommend you start with $50-$75 per day. This is a maximum limit, and not the amount you’ll actually spend on the campaigns. In my personal experience, hitting this maximum is rare. If that number scares you a little, though, consider it to be an investment. It’s much better to get exposure early on and make quick sales. How To Calculate Your Ideal ACoS? Amazon calls the cost per conversion as “Advertising Cost of Sale”. Selling Price – The price you charge customers. All FBA Fees – Referral fees, FBA fulfillment fees, and flat fees. Miscellaneous variable costs – Cost of shipping, supply cost, etc. Miscellaneous: $3 (this is just the shipping cost from the Chinese supplier to the Amazon warehouse). So we can spend up to $9 to get a sale and still be profitable. To calculate our ACoS threshold for our break-even point, we simply divide the net income from the Selling price (ie. $9/$27 = .33). This leaves us with a 33% ACoS threshold. That means we can make money on any keyword that has a Cost of Sale of 33% or less. 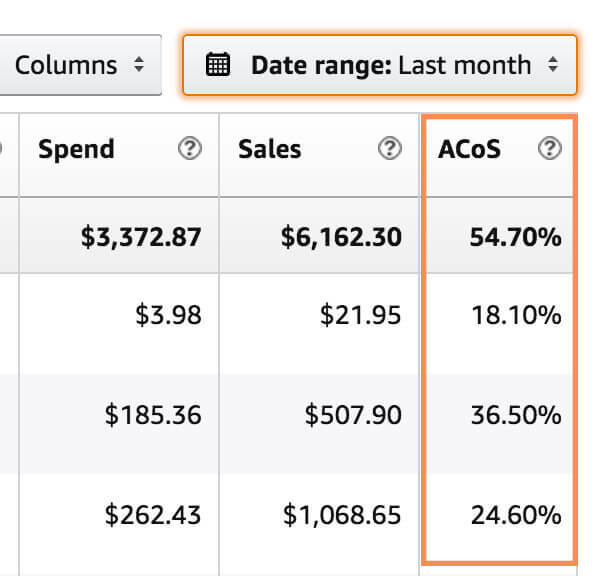 As you can see, it’s really easy to see which campaigns, ad groups and keywords are performing within your target ACoS, allowing you to optimize accordingly. How do I create an Amazon PPC campaign? I like to create two campaigns when I first start my Amazon PPC campaigns. The first is an “Automatic Targeting” campaign where Amazon determines which search queries to show my ad. The other is a “Manual Targeting” campaign where I choose the keywords to show my ads. How do I start an automatic targeting Amazon PPC campaign? Automatic Amazon PPC campaigns are very easy to create. All you need to do is enter your campaign name, budget and start date. Amazon then decides what keywords and match types it should bid on based on the information it has about your listing. Next it runs the campaigns on your behalf, within your budget limits. Usually it’s a good idea to run an Automatic campaign when you start out with PPC. Once you’ve let it run for a week or two, you can run an advertising report to show you which keywords are converting. From there, you can feed the information into a Manual campaign (see below). Don’t turn off your automatic campaign just yet, though! It’s nice to have it “running in the background”, so it continues to gather good keywords for your Amazon FBA product listing. How do I start a manual targeted Amazon PPC campaign? Manual campaigns allow you to upload a list of keywords of your own. You can source them from your automatic Amazon PPC campaigns, or they can be keywords you found using a tool like Keyword Scout. One of the best parts of manual campaigns is that they have a little more flexibility than automatic campaigns. Within manual campaigns, you have three match types you can choose from: broad, phrase, and exact. How can I find keywords for my Amazon PPC campaigns? The best tool out there for discovering hot new keywords is our own Keyword Scout tool. If you’re an active Jungle Scout web app subscriber then you should have access to Keyword Scout already. Log in to your Jungle Scout web app. Click on the Keyword Scout tab. Enter an ASIN or search term in the search box. Click enter and watch the keyword suggestions populate. Keyword Scout helps you find hundreds of high-performing keywords for your Amazon PPC campaigns at the click of a button. Don’t just start with one manual campaign. Start with three, one for each match type: broad, phrase, and exact. It’s worked well for me and it’ll probably do wonders for your Amazon FBA business, too. 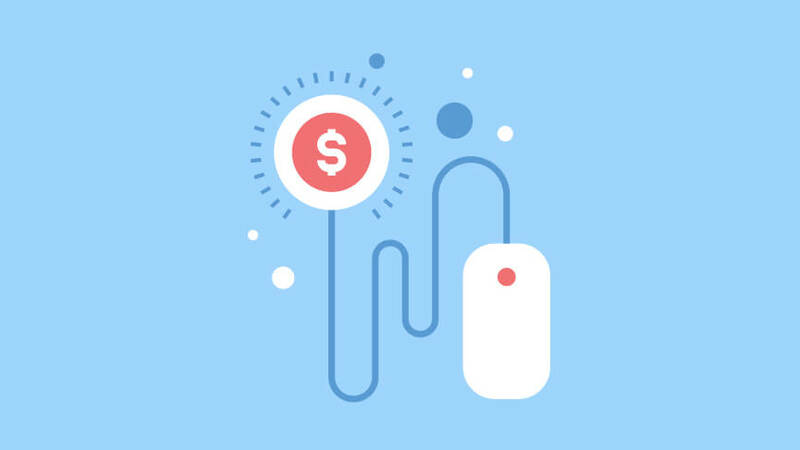 Not only will they help you see where your ad budget is best spent, but they might even come up with some interesting new long tail keywords which you can put into your other campaigns. I could take that new phrase and put it into an exact match campaign. While the broad “bamboo skewers” keyword was averaging $1.00 per click, “36-inch long bamboo skewers” averaged $0.25 per click. I could save $0.75 PER CLICK with that one, small change! How long should I run my Amazon PPC ads? It’s important you stand back and watch the beauty of the Amazon FBA business model at work. That means: run your advertising campaigns for at least a week without making any adjustments. Important Note: If you check your campaign results a few days after you start the campaigns, you may not see any sales. But don’t worry! Amazon’s advertising reports can be slow. Sometimes it takes 48-72 hours for conversions to be reported. 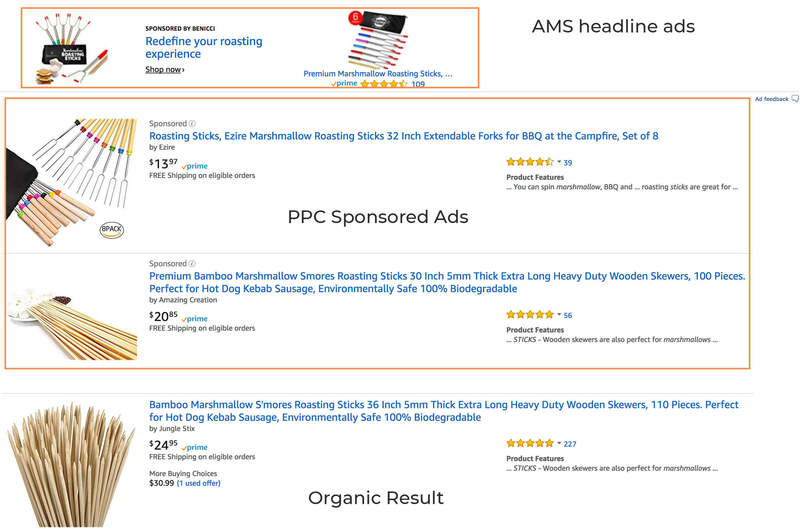 How do I optimize my Amazon PPC campaigns? Once you have collected a good amount of data, it’s time to sift through it. Check to see what’s working, what’s not, and optimize your money-making machine. #1 – Filter the keywords by ACoS. After a week or so, you should be able to identify which keywords convert to sales and at what ACoS. At this point you need to scan through the keywords, slowly reducing your bids, or pausing keywords that have an ACoS higher than your threshold. For Jungle Stix that threshold is 33% ACoS. By the same token, you need to identify any keywords falling below your ACoS and consider increasing those bids. Doing this will help your ads appear more often. More than anything else, this metric tells you which keywords drive the most conversions. Of course, just because something sells well doesn’t mean it’s profitable. The ACoS for a high-performing keyword could be beyond your budget. It hurts to “kill your darlings”, removing keywords like these or reducing the bid, but we’re here to profit, right?! I’d rather make $10 on three sales than lose $5 on 10 sales. You need to filter by Spend just to make sure that you know all of the keywords you’re investing in. Keep the ones that are converting, and get rid of the ones that aren’t. If a keyword is converting but at an ACoS that is above your targeted threshold, you don’t necessarily need to pause or delete the keyword. Instead, you can just adjust your bid accordingly. So, if your ACoS is 75% with a $1.50 bid, and you want it to be closer to 50%, try reducing your bid to $1.25. Keep making small adjustments (usually at $0.25 per week) until it gets to where you want it to be in terms of ACoS. When do you turn on paid campaigns? I like to turn on PPC campaigns as soon as I have a few reviews. Others may say to wait until you have 10 or more, and though it may be true that your conversion rate is higher as you have more reviews, I think it is more valuable to get a more active listing (remember that PPC campaigns often boost your organic ranking). Then you can start collecting data on converting keywords and incorporating them into your listing. How long do you collect data before making any changes? Ideally you would be able to collect data until you have hit a point of statistical significance, which some consider being at least a few hundred conversions. But most people don’t have the luxury of investing that much time or money. Personally, I think running an automatic campaign for seven days is enough time to determine what is working and what is not. What is the right number of keywords to include? There is no ‘right number’ of keywords to include in your campaign. However, I like to include 100 or more in my manual campaigns, and the keywords discovered in Automatic targeting campaigns. Amazon search is often about the long-tail keywords that may be four words or more, and it’s hard to identify those keywords if you start with too small of a sample set. You can always trim down your keyword list after a week of running Automatic campaigns. Then you’ll see your ACoS improve and your ROI (return on investment) increase nicely. If you haven’t started your campaign yet, why not learn on Bezos’ dime; there are always Amazon discounts and coupons floating around the internet. Track one down and apply it to your account! There’s a full recap, webinar replay and a ton of extra insights in there, to help you run extremely profitable advertising campaigns. Good luck with your PPC campaigns! If you have any other hacks and tactics that have worked for you, I’d love to hear them. Please share them in the comments. Thank you, I am learning every day, reading this article is like taking a crash course. In your reports, there’s information for conversion rates within 7 days. The higher the conversion rate, the more relevant the keyword is. And the sheet tells you which campaign it comes from, whether it’s manual or broad. Great blog post. I launched an auto campaign two weeks ago and was converting well and gained some great targeted words which has consistently and steadily increased sales. In two weeks I never used my entire daily budget which was nice. A few days ago, my sales dropped drastically especially on days that had usually been higher. I noticed my daily budget being used up for those days. When I ran a report on the words being targeted I realized the words that where targeted were ASIN numbers. My ACOS score increased by 17%. From what I can tell it is click fraud from a competitor. Is there a way of telling where clicks are coming from i.e. IP address? Do you have anything you suggest to limit click fraud? Do you need to have a brand registry completed in order to advertise if you have a seller central account? No. You only need Brand Registry for Enhanced Brand Content. First of all, thank you for your article Amazon PPC. It is not too long but concise and to the point. I joined Amazon Sellers and Jungle Scout about a year ago and I have learned a lot but I have spent 12 X $39.99 on amazon and even more on Jungle Scout 12X $69. I have just listed 2 products on Amazon and I have 3 more on their way from China. I am just starting my PPC campaigns so finding your article was a real good find. I have been using the Jungle Scout Youtube video’s to me started but PPC still seems like a “Hard Climb” to where I want to be. Thanks again for your insights and tips. Thanks for your article. I am trying to learn the big picture of selling on Amazon FBA, I have watched many online videos, plus almost all of the MDCS season 2 episodes (up to #19). Anyway, at this point the PPC campaigns has me most baffled. And it’s the main purpose of it, not the details of the manual campaign or adjust bids, etc, etc. For example, if I am planning to sell “widget ABC” why would I not simply review the current Amazon top selling “widget ABCs” and incorporate their keywords in my optimized ad copy? If their keywords drove successful selling to them would it not also do the same for my “widget ABC”. And the auction/bidding is still a bit confusing. If a keyword phrase is “soft and fluffy towel” what does a bid of $1.00 or bid of $0.50 mean? If someone bids $.055 and I bid $0.50 will the $0.55 get the search win and I would not? Anyway, because I have had a lot of work and business experience with project management, copy writing, design and marketing – the basics of finding products, sourcing, ad development and copy writing seems very easy. But, the heavy weeds of PPC has really bogged me down at this point. FYI, I am age 70 and have been a financial advisor for 29 years and have done well. I plan to continue managing assets for my existing clients until I sell my practice in next few years. But, I’d like to develop an Amazon selling business to generate $25,000 to cover my property taxes and a couple other expenses that’s easy to pay for now, but could drain through retirement savings when I finally flip the lights out in my financial business. Thanks for your help and advice. BTW, although I have not ordered any Jungle Scout products, I certainly will do so as you all have sooooo very much helpful information. thanks! blog was well explained. love it!